Madlands is the story of the making of ‘Can I Change Your Mind’, the reality TV show I discussed here a little while ago, as told by the younger and more positive of the protagonists. Anna visited Townsville recently on the book-promotion tour and we went along to support her (and, incidentally, Mary Who? Bookshop which hosted the event) and see what she is like in real life. I’m happy to say she was as great in person as she seemed on TV – warm, positive and articulate. Now that I have read the book I have some difficulty in separating it from the TV show and the author for this review but I will do my best. Madlands was written and published in haste (two and a half months is very quick for 90,000 words) but the writing is fluent and, perhaps because of the haste, refreshingly uninhibited by second thoughts: this is what Anna saw, this is what happened, and this is what she thought about it. The book follows the sequence of the show, from first meeting Nick Minchin near Moree and introducing him to her uncle, to their final chat on the beach of Heron Island. It soon became clear to Anna that the producer was trying primarily to ‘make good TV’, i.e. that he would put drama and entertainment ahead of accuracy or fairness, and that Nick was not going to change his mind about climate but was going to use his political skills against her attempts to get her message across. She, of course, was primarily motivated by the desire to inform the audience about climate change. To the extent that each of them pursued those aims they worked at cross purposes, something which vaguely unsettled the show but is much more clearly articulated in the book. 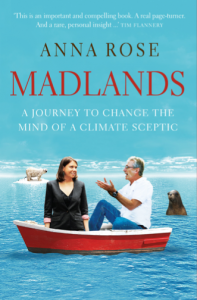 Madlands, however, allows Anna to say what she wanted to say on TV, and each chapter tends to comprise a journey, an interview and her reflections on what wasn’t said but, she thinks, should have been. The latter often includes significant chunks of climate science, presented simply enough for the average reader to grasp easily. The book is unavoidably episodic, since a dozen journeys and as many interviews (with some rather interesting and eccentric people, admittedly) don’t make for a cohesive story line and there is no real character development to tie it all together. Anna just does her best to stay on top of events, while Nick is determinedly impervious to any argument she might present. She does understand him better by the end of the journey than at the beginning but neither of them have changed their minds. In spite of minor faults, Madlands is an easy, pleasant read. But who should, or will, read it? It contains a lot of the basic science of climate change but it is not a great climate-science primer (Picturing the Science is far better) because its focus is elsewhere. It also has a lot of interesting and useful insights into activism and the politics of climate change, but the same applies: it isn’t focused on the topic, so there are better books on the subject. In the end, it is inextricably bound to the show which spawned it, in that most of its readers will be drawn to it by the show and the readers who get most out of it will be those who have seen the show. In her talk at Mary Who? Bookshop, Anna quickly sketched her strategy for shifting public opinion. It grades the population according to a sequence from ‘actively opposed’ to doing anything about climate change, through ‘passively opposed’, ‘neutral’ and ‘passively supporting’ to ‘actively supporting’ action on the issue. And her approach is to forget the active denialists (because they are a tiny group and won’t change anyway) and try to move everyone else one step to the right in her chart – ‘passively opposed’ to ‘neutral’, ‘neutral’ to ‘passively supporting’, or ‘passively supporting’ to ‘actively supporting’. Hopefully many of her readers will learn more about the science and politics through Madlands and make just such a shift. There are some really nice tee-shirts on the AYCC site and you can buy the book there too if you’re not close enough to Mary Who? Bookshop.